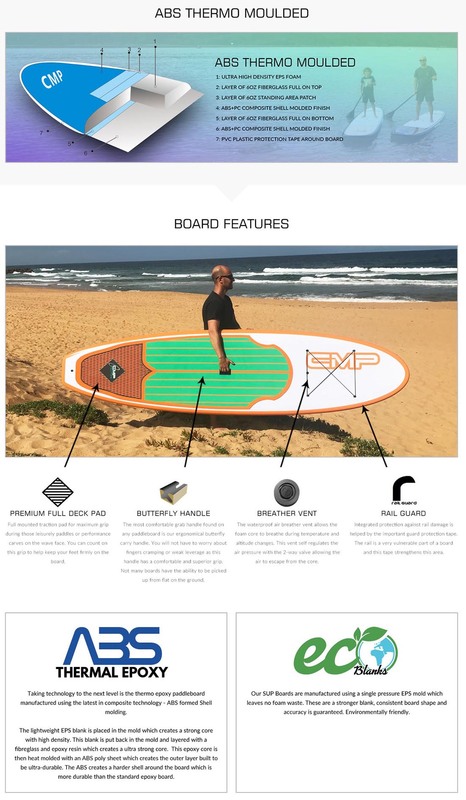 CMP Boards Australia was formed back in 2010 and Funky SUP’s in 2015. We are the manufacturer of these boards and have sold thousands over our eight years distributing these around Australia. This guide is for those that are new to paddle boarding and need some help with the differences in styles of paddleboards. As the name suggests an All Rounder SUP is designed as a board that can do it all and is a perfect beginner’s choice. This style is our most popular board range due to it’s versatility, whether it is flat paddling on the lake or catching smaller ocean waves. Our All Rounder range is called the Cruiser model as that’s exactly what you can do on it. It is a very stable choice as its width between 31 to 33 inches and thickness of up to 4 ¾ offers great flotation. A board should be at least 31 inches wide for stability especially if you are a new sup paddler. Our range of All Rounder boards are manufactured using different materials and all perform slightly different. WHAT SIZE IS A GOOD OPTION IN AN ALL ROUNDER BOARD? We will use our epoxy range as a guide here. Keeping in mind that the 10’6 Soft Top and 10’6 ABS Thermo are great entry level choices and these hold 120kg. 10’ Cruiser – The smallest All Rounder Board in our range and is perfect for those looking for a shorter all rounder board that performs well in surf conditions. The classic lines of this shape with soft edges is perfect for turning and riding the waves, with the length allowing you to easily manoeuvre onto a wave. 10’6” Cruiser – Our most versatile size in our range and hence makes this a very popular model. Its wide body design and round tail makes it a stable and easy to ride board. This board has all the design elements of a performance board so is perfect in surf conditions. 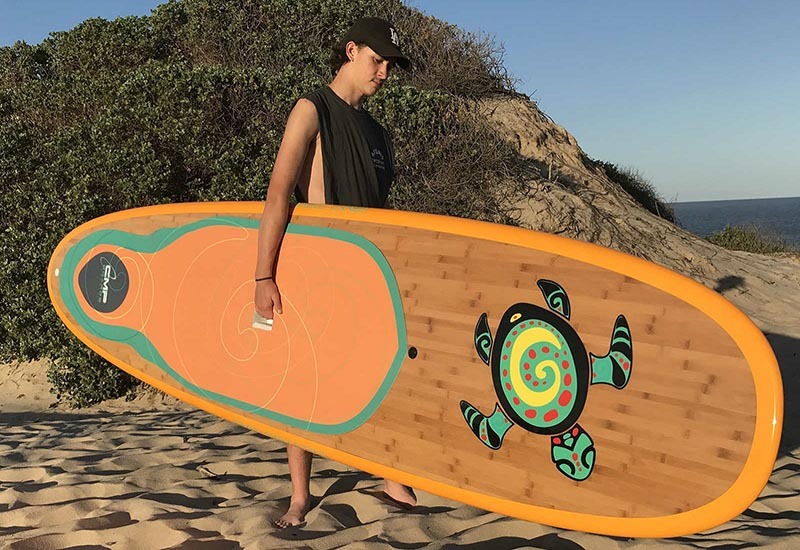 11’4” Cruiser – A perfect board for those heavier paddlers, as well as the ideal family choice as the kids can paddle with you as it holds up to 120kg. A super stable board with loads of floatation, this is ideal for those looking at doing more flat paddling as the added length increases the speed and you will get from A to B faster on this board. A wave board is designed for performance, for those experienced riders who want the power and strength in a board to surf any size wave. Choosing a wave board comes down to the size of the surfer and your experience. Being a high performance board it is designed to perform on both small and larger waves. These are generally more unstable and can be harder to ride then other SUP Styles. But it is all designed for quick turns and wave surfing! Our range of surf series boards are all manufactured from epoxy and have been wrapped in carbon which make them very durable and very lightweight. We offer 2 ranges which are both manufactured from the same materials. This range is for those that are more experienced riders who want the power in a board to surf any size wave. The narrow width of 30 inches allows for ultra sharp turns and tricks. Designed to be ridden like a shortboard and handle small and large surf conditions. This is very maneuverable with its short length, is ultra responsive and very lightweight. This range is ultra-wide at 32 inches so is the best board if you want to try a wave board for the first time, because stability will be your friend in the waves and you will be thanking the board for that extra volume. Still very responsive and quick on the turns, designed with extra length for those that want the reassurance of extra stability on the water. This is a perfect choice for fitness training and is designed for speed and long distance paddling. A narrow shape which creates a long glide and fast board. 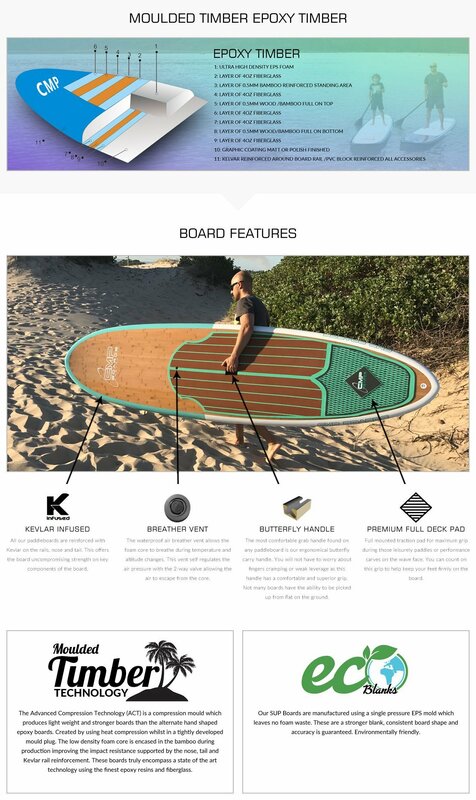 This board is a stable, versatile board which is great for ocean or river paddles and gets you from A to B in record time. Inflatable Paddleboards are becoming increasingly popular due to them being great for beginners, easy to store and transport and very convenient. Boat owners and families are finding these a great alternate SUP. The fact these roll up into a small backpack when deflated, are very durable and won’t scratch like an epoxy board and affordable. They are quite firm when they are pumped up to the correct PSI. Although these boards have benefits, we must also mention that these do pick up the wind a lot when on the water so you do need to pick the days that you paddle. Some people do get very annoyed with the procedure of inflating and deflating every time they want to use it, but you can keep them inflated which is great if you have roof racks. Not so great if the idea was to throw it in the boot. 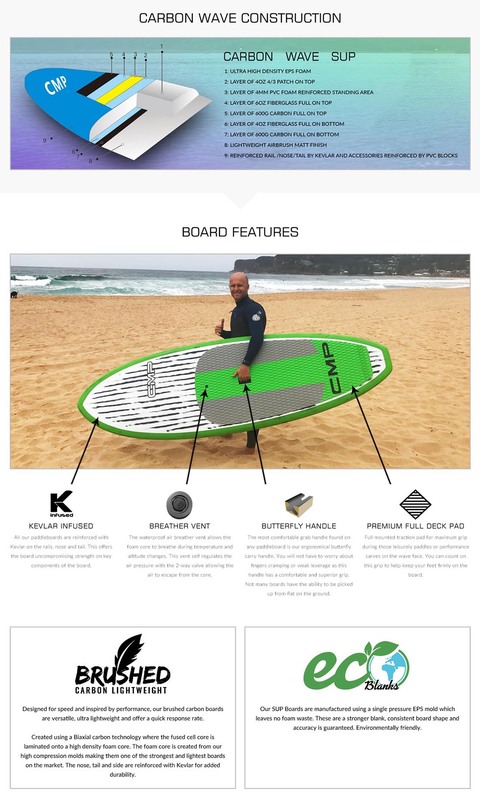 So this is not the style if you want a performance board that will glide through the water, but it will get you on the water to have some fun. CMP Boards Australia is based at Berkeley Vale, on the NSW Central Coast. We have sold over 10000 paddleboards since we started back in 2010. Our range has a focus on quality boards at an affordable price. We moved our location from Erina in 2017, where we had been for seven years, to a large warehouse in Berkeley Vale so we could focus on distributing these boards throughout Australia from the one place. Our Erina showroom was closed for this reason. The main focus of CMP when it originated was to deliver a quality high performance SUP board range that was affordable. CMP is now known for the quality product, high performance and affordable range they produce. Funky SUP’s is our newest range which was initiated to provide a fun and colourful range of boards to our large customer base. This has proved popular since it was introduced back in 2015. Our stand up paddle board design is continually evolving. The materials and the production techniques we use currently are considerably advanced than we first started producing these back in 2010. The newer technology has allowed for boards with better hydrodynamics as well as eco-friendly options. We are proud of our products evolving and each year part of our development is to evaluate all our construction techniques and materials. This is to make sure we are producing the best quality boards for our customers. The boards are designed using 3D technology to enable a precision shape. That means that they come out standard sized every time. When a design is perfected already, why not use the tech to replicate it? The boards are then laminated and hand finished. It is the perfect fusion of personal touch meeting technological innovations. Our range includes unique designs and these are sketched firstly by our graphic artist, then the art is put into the CAD software with the board shape to determine the exact profile. This 3D technology allows the concept to be brought to life prior to production. Our boards truly are a combination of technology and distinctive concepts. All of the materials for the stand up paddle boards are made with quality raw materials which include using the finest epoxy resins and premium fibreglass cloth. We currently use Eco Moulded Blanks which offer many benefits including zero eps foam waste and a much denser foam blank, not to mention being environmentally friendly. Our 2018 range have all been developed using the latest heated compression moulded technology, known as ACT (Advanced Compression Technology). This is the most advanced type of mould currently used to produce a more durable board from a tuned mould. A board made using this technique is 30% stronger and on average 2kg lighter, when comparing vacuum sealed manufacturing. The disadvantage is the high cost to produce each mould and this is why smaller paddle boarding companies will not go to the expense of buying these precious moulds. It is very important to evaluate the facts of getting a stronger and lighter board that is more durable. CMP Boards and Funky SUP’s also use environmentally friendly materials. For example, the veneer is made from natural bamboo and we use eco moulded blanks which aims to reduce foam waste materials. In the old system, 60% of the raw materials went to waste. Now with the new processes, there is no waste at all with each blank coming from a single pressure mould. The foam also comes out lighter and stronger than the original boards. For anyone that has had to carry their boards to the lake, they understand that lighter is better. And no one wants their board breaking in the middle of all the fun. Next time you’re at the lake, take the time to appreciate how these new innovations are made in ways that are good for the environment.